© Posted on October 30, 2017, by Michael E. Newton. For the past two years, since publication of Alexander Hamilton: The Formative Years, I have spent countless hours, days, weeks, and months doing research in the vast archives of the Rigsarkivet (Danish National Archives), US National Archives, and UK National Archives searching through the records of St. Croix, Nevis, St. Kitts, and other West Indian islands. This time consuming task has paid off as I have discovered many new and exciting facts about Alexander Hamilton, his family, friends, and colleagues. This extensive research has been conducted and continues with publication of a new book in mind. The research, however, is taking much longer than planned and much remains to be done. Seeing that publication of a book containing these new findings is still some time away and wanting to share these new discoveries with the public, I am starting this blog. Sharing these exciting new discoveries in a blog instead of or in addition to writing about them in a Hamilton biography has a number of advantages. A blog allows me to communicate these new discoveries in greater depth. In a Hamilton biography, each discovery can only be presented in the context of the main narrative or perhaps in greater but still limited detail in an endnote. In a blog, however, the full story of each discovery can be shared. The information itself, images of the original manuscripts, transcripts and/or translations, analysis, context, and implications can be detailed in a blog but not in a biography. What may be a one-sentence revelation in a biography can be many paragraphs of useful and interesting information in a blog. This is especially relevant for discoveries only tangentially related to Alexander Hamilton. For example, new information discovered about another Founding Father might merit one sentence, a single phrase, or an endnote in a Hamilton biography but can be written about in full detail in a blog, which will be incredibly interesting to the general reader and absolutely invaluable to those researching and writing about that person. Thus, in addition to revealing these new discoveries sooner rather than later, this blog will present the information in greater depth and in a different context than would be possible in a Hamilton biography. My plan is to blog once each week, with possible exceptions for holidays and research trips. The nature of the blog posts will vary from week to week. Some may present a single new discovery that tells a complete story. But many, perhaps most, of the posts will not be of this nature. In many instances, I have found references to the same people and sometimes the same event in various volumes and only by combining these disparate sources can one piece together the complete story. These longer, more complicated narratives involving multiple new discoveries will most likely be posted over a series of week so as not to overwhelm either the author or the reader. In contrast, I will also be sharing discoveries that reveal only a fraction of a larger story. It is possible that the full story will never be discovered because the details were never recorded or those records have been lost or destroyed. Alternatively, perhaps more information will be found in the future and the full story revealed. Although these new discoveries are incomplete, I will gladly present them as is and hope that more information will be discovered in the future, whether by me or someone else. Since I decided to go ahead with this blog despite the above concerns, some measures are being put in place to prevent others from taking credit for these new discoveries and to make it more difficult for anyone to “steal” them. I will not be providing citations for the new discoveries that will be presented. As a historian, I believe strongly in accurate and useful citations. 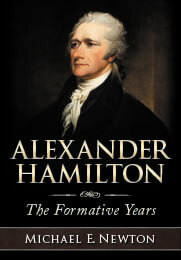 In fact, I have more than 200 pages of endnotes in Alexander Hamilton: The Formative Years to prove that! But it’s just so easy to copy someone’s work from a blog and paste it into another blog or even a book. To maintain some “ownership” over these discoveries until my own book is published, I will not be citing the original sources on this blog. In most cases, however, I will share images of the sources, which will serve as verification of the findings (and will be interesting exhibits for the reader). These, however, will be watermarked, again so no one can “steal” them and take the credit for themselves. Additionally, as a warning to anyone who might “steal” my work, each blog post will be submitted to Internet Archive’s WayBackMachine to provide third-party proof of the contents of each post and the date of publication. Despite the above restrictions and warnings, historians, biographers, bloggers, and other authors are free to incorporate these new findings in their works IF AND ONLY IF they cite the blog post in which the discovery is presented (including the URL). In fact, I encourage the sharing of the new discoveries presented in this blog, as it is my goal to spread accurate information about Alexander Hamilton and thereby correct the errors, lies, distortions, and myths that are told about him.